Lion has furthered its expansion into Asia, opening its first Little Creatures venue in Singapore. Little Creatures’ regional brewer, Jum Ryan, will brew across the new Singapore and existing Hong Kong breweries. Little Creatures Mohamed Ali Lane, a 180-seat brewpub in central Singapore, is Lion’s second venue in Asia, having opened Little Creatures Kennedy Town in Hong Kong in 2016. Lion Global Markets Managing Director, Matt Tapper, said there has been a surge in demand as the Asian craft market flourishes. “We know that consumers across Asia appreciate quality products with genuine credentials. Now is an excellent time to step into the South East Asian market by creating a home for one of Australia’s best loved craft beer brands in Singapore. “The Lion Global Markets strategy is built around patiently and sustainably embedding our portfolio of high quality products in gateway cities worldwide. The combination of productive free–trade agreements and the emerging Asian middle class are providing just the right conditions for Lion’s expansion into new markets. “We pride ourselves on the positive reputation that all of our venues across Australia and Asia have within their local communities. We’re dedicated to continuing this focus, to ensure that Lion becomes an integral part of the local Singapore community as we provide great beers, a great menu and a great hospitality experience,” he said. 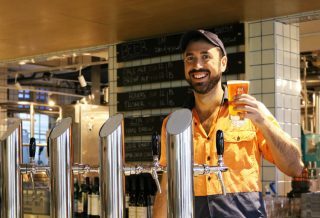 The new venue has capacity to brew on-site, though the Little Creatures core range and a selection of White Rabbit beers and James Squire Orchard Crush Cider. Local brewing will be limited to a targeted local seasonal range. The venue will feature a casual Mediterranean-inspired menu “with a Fremantle twist”. In addition to Lion’s Little Creatures venues in Singapore and Hong Kong, Lion is planning to open a third venue in London by the end of the year.